Great knife! M4 steel is top knotch! More grip than the sticky bandits! Razor sharp out the box! Worth every penny! I've had this for two years and got as a gift. I have large hands and this fits like a glove! My blade somehow got slightly off center. I sent it to Benchmade to get sharpened and they refurbished it and gave me a new blade at no charge! 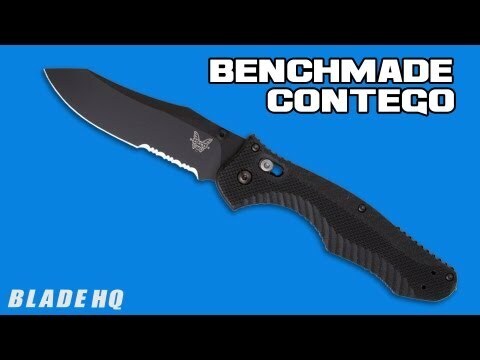 That is why you buy Benchmade...they stand behind their products. 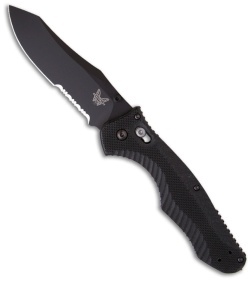 Sometimes you buy a brand name for marketing purposes, but Benchmade is the real deal. M4 steel. Very strong hard blade. Not the easiest steel to sharpen but it does hold an edge. I use the Work Sharp Ken Onion with the belt grinder attachment and finish it off with a strop block. G10 handle. Excellent gimping on handle. Secure in hand especially with the Osborne lock. 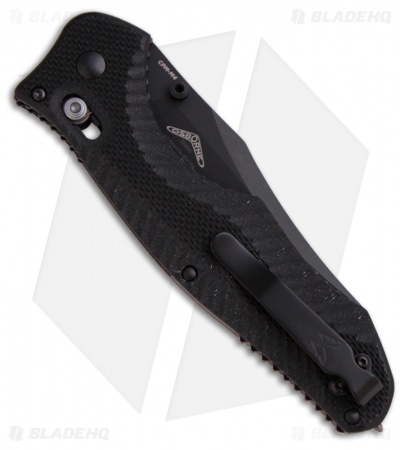 Despite a 4" blade it is very concealable and easy to carry. Not a piercing blade but a great slicer. Great EDC all around knife. No complaints with a Benchmade. This knife is great! I love the fluid motion of it. It flicks open very easily and locks solidly. Completely operable with one hand, (many claim it, few actually nail it like this). True ambidextarity as well. I am very impressed with the simplicity of the locking system and feel like it could survive just about anything i could throw at it. I like the handle design as the grip seems very efficient and holds tight. Best hard use knife I’ve come by. My only complaint with mine is that the axis lock springs could be stronger. The blade is heavy and thick, and handle is very grippy to the point I could see it would hurt lesser men’s hands. The window breaker is a nice addition. I bought the Contego due to design and versatility. The blade has a good length, coated in Cerakote so it's highly resistant to rust, and is as tough as nails. I like the carbide glass breaker so I keep it in my EDC bag. The only downside is it is hard to sharpen when it gets dull and the pocket clip can tear your pockets. An absolute outstanding knife! I do wish it was slightly smaller. The blade steel, CPM-M4, is amazing, it holds a ridiculous edge, but can be difficult to hone/sharpen (I use the Spyderco Sharpmaker). The ergonomics of the handle provides a very strong forward grip and when in reverse grip it's very comfortable to hold perfect for self-defense or what have you. The jimping on the steel liner is aggressive, and the G10 scales are even more aggresive. So theres gratuitous positive grip for outdoor use. This is a no fuss, no BS knife with badass/overbuilt pedigree. The guys at BM know what they're doing for the Black Class. If you want a abusable axis-lock knife, the 810 Contego from Bencmade is your choice.